This month’s book review was inspired by my very sweet kitty, Theo. I’m not sure if everyone who reads this book review blog also follows my Instagram, @andreasbookreviews, which accompanies this website, but a lot of my posts involve my kitty, so I thought I should merge the two this month. 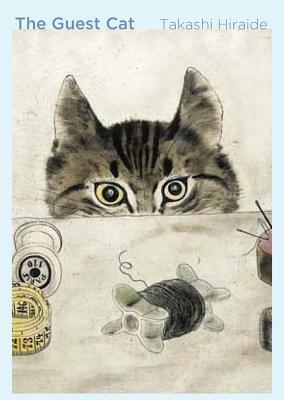 I can’t emphasize enough how happy I am that I decided to do this, because the Guest Cat by Takashi Hiraide is an incredibly charming and delightful read. I’m so thrilled to share this special book with all of you. I have to start off this review saying, even if you despise cats, you’ll enjoy this book. This book is less about actual cats and more about critters and moments that touch and change your life. The author has stated in interviews that the events that unfold in this short novel are based off of a real experience. The novel is written in first person by a thirty-something freelance writer who works from home with his wife, who is also a freelance writer and proofreader. The protagonist and his wife, both unnamed, live in small, rented guest house that is part of a beautiful property, which is nearly 5,000 square feet, that is owned and cared for by an old woman and her ailing husband in a quiet part of Tokyo. The property contains a pond and a lush Kyoto-style garden that blossoms during different parts of the year, revealing beautiful flowers and even more beautiful wildlife in the middle of a chaotic city. A lot of reviews I read about this novel emphasize how the protagonist and his wife seem to live a life that needs a spark and while I agree that sometimes it takes an outside force to make things happen, I wouldn’t say that the couple is having some sort of issue with their relationship. The protagonist just turned into a freelance writer and they’re both trying to make ends meet, but the neighbor’s cat, Chibi, does reveal a side of both characters that was long dormant under all of that freelance work. If you look at the except above, the protagonist states how he, like many of the readers that could pick up this book, was never a cat person. He admits that he was disgusted with how much cat lovers gush over cats. It takes a chance meeting with Chibi to realize that it was less about liking the species and more about the fact that he had never experienced having one around. And that’s what the sweet, petite Chibi reveals to the protagonist and the readers, that sometimes it takes something you don’t know to make you realize that it’s exactly what you need in your life. And the prose – so beautiful and true – makes you not just care about Chibi, but also encourages to you to look around at the life around you. The protagonist and his wife are so consumed by their work, they don’t realize the beauty and wildlife that surrounds them. For example, one of the most touching and beautifully written parts of the novel is about a dragonfly and the protagonist. Who knew that the interaction between a man and a dragonfly could be so thrilling and lovely? So, let’s get more into the story, basically the protagonist and his wife start to get daily visits from the neighbor’s cat, Chibi. They soon come to appreciate her daily visits and anticipate them. The wife starts to venture off with Chibi around the garden and they both become very emotionally attached to this little critter. By opening their hearts to Chibi, they also start to open their hearts to their surroundings by taking care of the lush garden, helping the owner of the property and overall, appreciating daily life with a lovely, fun cat. This awakening starts to dampen as the characters realize that their time is running out both in their guest house, which is going to be sold soon, and the fact that something alarming happens to Chibi. The couple have to start a new life in a new part of Tokyo, while also retaining everything they learned and loved about Chibi, giving them a deeper relationship with themselves, their surroundings and their world-view. Time does not stop. The tide will continue to move. Change has to happen. Within all of this writing, comes the realization that we have to enjoy our present, while also treasuring small moments with everyone and everything. I know that sounds incredibly corny, but that tide is going to come whether you like it or not, so you might as well try to enjoy the most of it. So, would I recommend this novel? I’m going to give you an overwhelming YES! It’s so short, only 140 pages, and it’s so charming and sweet that you’re going to want to hug whatever animal is surrounding you. If anything, you might even gain an appreciate for cats, which I always encourage. Now, enjoy a Boomerang of my sweet Theo. I certainly will!